Such is the impossible situation of the Jewish twentieth century, bookended by European anti-Semitism in its first half and increasing ostracism of the Jewish state at the end of the second half. The violence of the Israeli occupation of Gaza and the West Bank has damaged Israel’s reputation significantly, with organisations like Btselem documenting Israel’s human rights violations in the Occupied Territories. The Boycott, Divestment, Sanctions movement describes Israel as a ‘settler colonialist’ nation practising ‘apartheid’, a position that has become increasingly dominant on the Left. But if it is clear that Israel has lost much of its legitimacy as a state, it is also clear that Europe never truly solved the ‘Jewish question’ raised in the late nineteenth century, and its effects are with us (and in the Middle East) to this day. While Zionism as an ideology and political project has been ideologically dominant among diaspora Jewry for the best part of a century, there are signs that there is at the very least an emerging ambivalence in Jewish communities about Zionism and the broader project of Jewish sovereignty. The appearance of groups like Jewish Voice for Peace and If Not Now that support the BDS movement is one sign of an ongoing sea-change in the Jewish community. 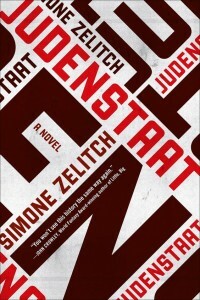 Another such sign, interestingly, is a new work of alternative history by American Jewish writer Simone Zelitch called Judenstaat (‘Jewish State’), a title which takes its name from a pamphlet by the father of modern Zionism Theodor Herzl. In Zelitch’s re-imagining of the twentieth century, a Jewish state was founded after the Second World War in Saxony instead of Israel. A murder mystery, Judenstaat’s central character Judit Klemmer works as an archival historian piecing together a presentation for the country’s fortieth anniversary. While she does this, she attempts to discover if the murder of her husband had in fact been at the hands of the German fascist convicted of the crime. Judenstaat is written as a kind of amalgam of Israel and East Germany, with the state replacing East Germany and maintaining close ties to the Soviet Union. The rich history of Jewish Leftist activism is gestured to, with the origins of the state in the Bundist labour movement. Judit attends lectures at university on the Jewish anarchist Rosa Luxemburg, recalling the early socialist movement in Israel, where the Labor party dominated its early decades and kibbutzim had an outsized effect on the Israeli imaginary. Indeed, Zelitch retains some of the key controversies of recent Jewish history. In Judenstaat, the official language of the state is German, not Yiddish, and it is clear that Yiddish is suppressed for much the same reasons as it was suppressed in the emerging Hebrew-speaking Israeli state – because Yiddish represented the weakness of diasporic Jewry, of the humiliation of oppression, of the pogroms and the Holocaust. In Judenstaat, Yiddish remains the language of the ultra-religious Hasidim, not everyday Jews. Zelitch very clearly seems to consider this a great loss for Jewish civilisation. The violence of the Israeli occupation is gestured to as well, with Zelitch’s Jewish state bulldozing the houses of Germans – here called Saxons – much as Israel has done in Palestine. As in Israel, Saxons in Judenstaat are systematically discriminated against, excluded from employment and doing only the most menial of work. The marriage of Judit Klemmer to a Saxon is scandalous, and Saxons are routinely denigrated. Here the most lurid imaginings of Israeli right-wing politicians, that the Palestinians in some sense are Nazis, becomes true, with the Saxons blamed for the genocide of their parents and grandparents. Zelitch describes a nascent Jewish colony failing in Israel, with another historian in the novel arguing that it failed because ‘the messianic element doomed the project from the start. “Messianic” wasn’t even her name for it. It was their own. Palestine Jews believed that in returning to the land mentioned in the scriptures, they becomes the agents of their salvation.’ Here Zelitch challenges the very idea of Zionism, the idea that Israel is the fulfilment of thousands of years of Jewish yearning for the Biblical land, for Zion (Jerusalem), for Eretz Yisrael. Life is more complex than the idealism of twentieth-century Jewish politics, she seems to be suggesting. Indeed, it is difficult to work out exactly what Zelitch is saying at times, and the novel raises more questions than it answers. First, in its alternate history conceit, is it suggesting that a Jewish state should have been formed in Europe rather than the Middle East, where the Germans did owe Jews restitution? Is the book simply about diasporic Jewry wanting to escape the problems of Zionism? Like Michael Chabon’s Yiddish Policeman’s Union, which set a Jewish state in Alaska, some of the pleasure of the text is in the world-building of an alternative Jewish society. But Judenstaat seems to be more complex than that. In repeating anew Israeli history, is Zelitch suggesting that history is inevitable? Were the messianic dreams of Jewish Zionist and socialist politics in the twentieth century doomed to end in bloodshed and oppression? Was pursuing Jewish sovereignty a mistake? I won’t spoil the ending, but the secret that drives the plot of Judenstaat is that of Jewish violence. The desire for revenge for the Holocaust is given voice, understandable and horrifying all at once. In the end, the novel suggests that there has been a cost in blood that purchased the Jewish state, and Jews have well and truly lost their innocence. American writer Peter Beinart has written about what he calls ‘the central Jewish question of our age: the question of how to ethically wield Jewish power’. Judenstaat suggests that this question may be the most difficult of all. Dr Emily McAvan teaches in the College of Arts at Victoria University. Emily: I found this by chance and have to write and say this is one of the most thoughtful responses to my book I’ve seen yet. I don’t endorse the idea of a Jewish state in Europe, and you’re right that I raise more questions than answers, but I just wanted to write and thank you. You’re welcome, Simone. I thought it was a great book tackling some of the most pressing issues facing us as Jews today, in a very readable and gripping way. I hope it finds the audience it deserves.